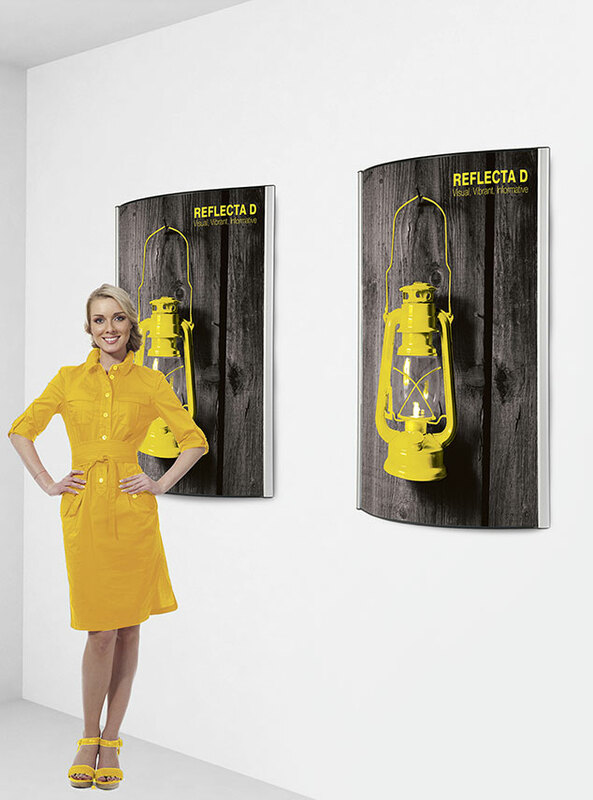 Reflecta Lightboxes and Graphic Pods are freestanding double sided systems. Elegant looks and ease of assembly make it ideal for retail or display applications. They come with Trappa style posts which mean they are easy to use with a ‘snap action’ aluminium rails, which are designed to support a range of media types. This allows for quick and easy graphic installation and changes. 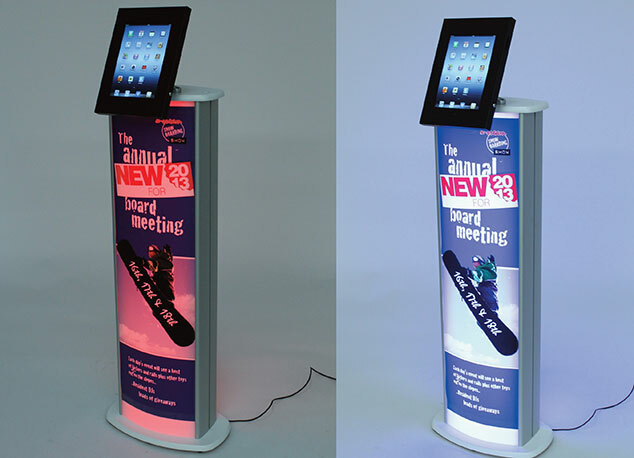 The Slim and Standard Linear Column is a neat and streamlined Graphic or Lightbox counter with the optional accessory of a multi-angled iPad holder; ideal for when extra visual information is required. A highly visible, wall mounted, D-shaped lightbox display solution and thanks to a snap frame changing graphics is quick and easy. 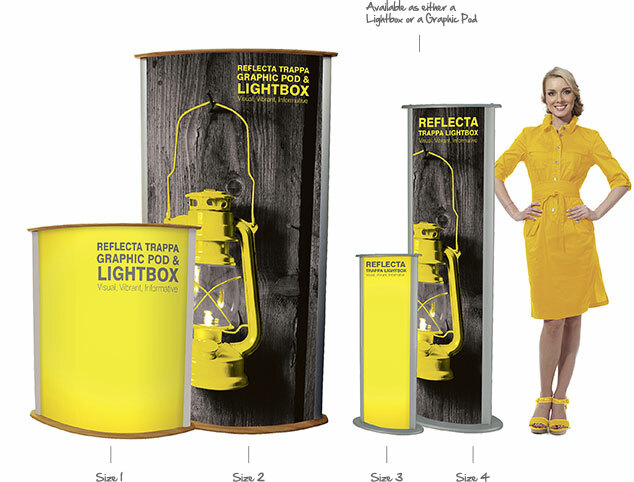 All four sizes are available as either a Lightbox or a Graphic Pod. Please add 12mm clear area to each side of the width and again on the height to allow for fitting to the system.10mm bleed would need to be added on top of this. To supply print ready files please set your artwork up to the visual graphic dimensions then add 12mm clear area to each side of the width and again on the height, 10mm bleed to all edges and crop marks. Supply the file to us as a hi-res pdf with all fonts embedded or outlined and the colours set to CMYK. Images need to be 72dpi minimum in the artwork when at 100% size to ensure the best quality images are printed. Lightbox option available and comes with white opaque acrylic panels to front and back, which the printed graphic attaches to, these panels diffuse the light. Lightbox has optional white or RGB LED lighting inside. Please add 15mm clear area to each side of the width and again on the height to allow for fitting to the system.10mm bleed would need to be added on top of this. To supply print ready files please set your artwork up to the visual graphic dimensions then add 15mm clear area to each side of the width, 10mm bleed to all edges and crop marks. Supply the file to us as a hi-res pdf with all fonts embedded or outlined and the colours set to CMYK. Images need to be 72dpi minimum in the artwork when at 100% size to ensure the best quality images are printed. To supply print ready files please set your artwork up to the visual graphic dimensions and then add 10mm bleed to all edges and crop marks. Supply the file to us as a hi-res pdf with all fonts embedded or outlined and the colours set to CMYK. Images need to be 72dpi minimum in the artwork when at 100% size to ensure the best quality images are printed. 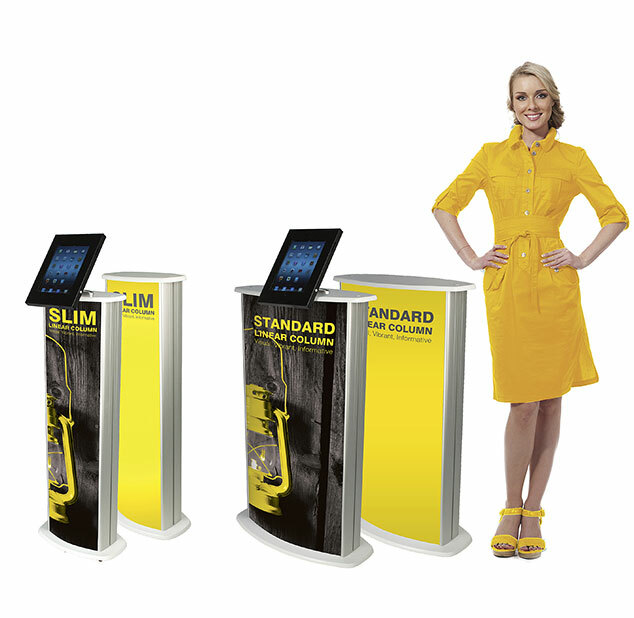 Your iPad can be mounted to your Slim and Standard Linear Column. 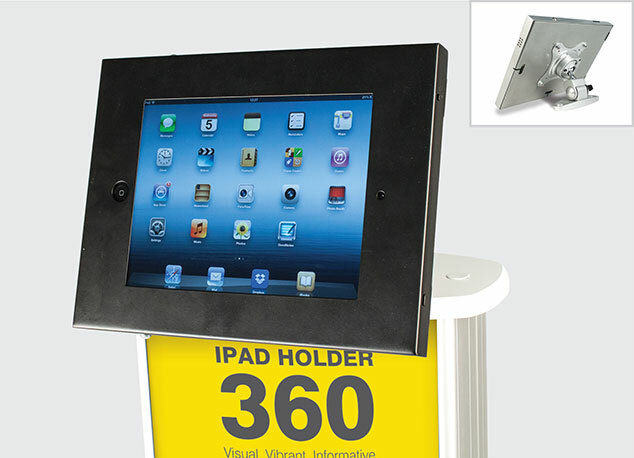 As the name suggests your iPad can rotate 360° and can tilt at any angle, adding multimedia solutions to your display. • Comes complete with all parts and fixing kit • Available in black, silver or white surround • Secure housing unit Please note iPad not included.